British Beatles Fan Club: THE TREMBLING WILBURYS XMAS XTRAVAGANZA! The Trembling Wilburys are the UK’s first & best tribute to rock supergroup the Traveling Wilburys, featuring a line-up of top vocalists and musicians who perfectly recreate the unique sounds & style of the amazing band created in 1988 by George Harrison, Roy Orbison, Bob Dylan, Tom Petty and Jeff Lynne. Band members include Glen Knowler, truly uncanny as George Harrison, while Dave Collison perfectly captures Roy Orbison‘s incredible vocal range and look. 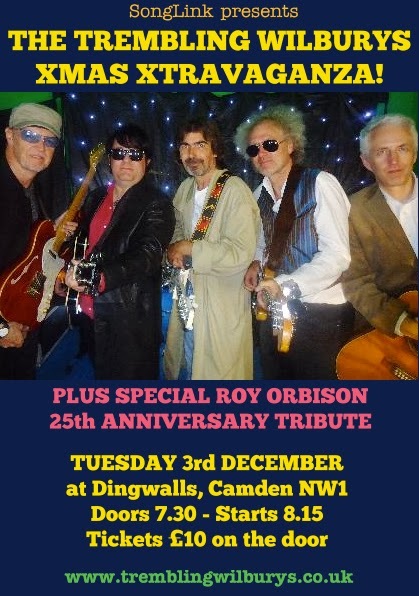 Tonight's show will feature a full Wilburys set including all the classics (Handle With Care, End of the Line, She's My Baby plus Beatles & solo George etc), along with a special tribute set to the late, great "Big O", Roy Orbison who left the bandstand exactly 25 years ago on December 6th, 1988.